I was flying in formation with a camera plane when I rolled my Super Decathlon to the inverted position. This shot was taken just as I started to roll inverted. This WWII advanced trainer was used by many cadets on their way to our battles in WWII. The Pratt and Whitney R-1340 600 Horsepower engine and 9' 2" propeller makes this plane a true classic. Photo by Curtis Guillet. This photo was taken at Lake Hawkins near Tyler, Texas. My safety divers were there to help should the unexpected have happened. Luckily the test was nearly flawless. 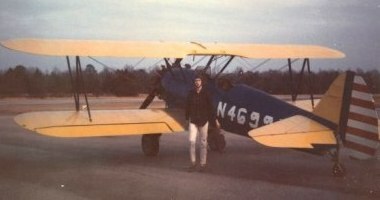 I purchased this plane in 1970. It was formally a WWII primary trainer. I was 19 in this photo taken at Magnolia, Arkansas. 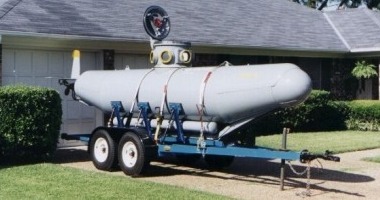 My submarine The Vindicator is located at home for a day or two as we have a party celebrating a successful test. 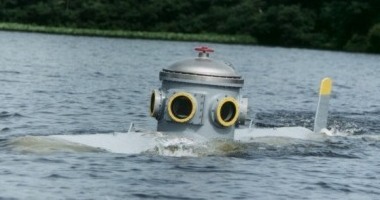 I was happy that the first dive was successful. You don't count dives. You count surfaces! 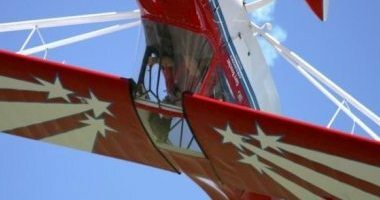 I still love flying airshows! 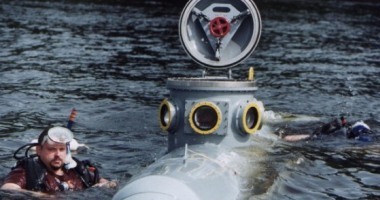 This photo was taken at Lake Hawkins during the first set of dives. Vindicator was at full power on the surface. 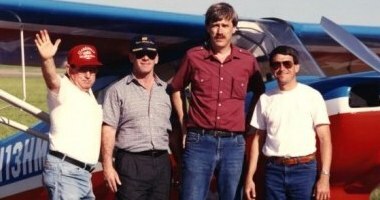 Photo from an airshow in Carthage, Texas in the mid 1980s. This photo taken by a professional photographer as I flew over him just feet above the ground. A very nice photo! Ready to Rock N Roll! WHEELMA can most easily turn in this position. She can also take steps with her front set of wheels raised. 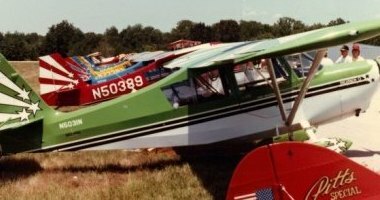 This show in 1985 featured a number of aerobatic acts and also a bevy of beauties who rode down the flight line with the performers after their performance. 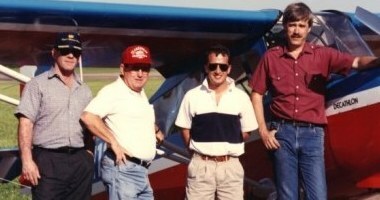 I flew for years with Marion Cole at many airshows. 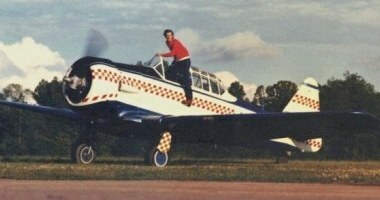 This is one of my favorite photos of the two of us taken at Springhill, Louisiana during a donated airshow. 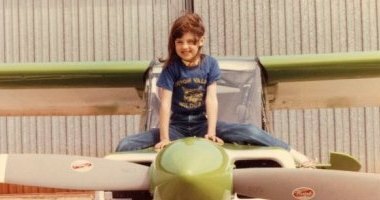 Jenelle was about 7 when she posed for photos with my first Decathlon. She has grown a bit now and lives in New York City. 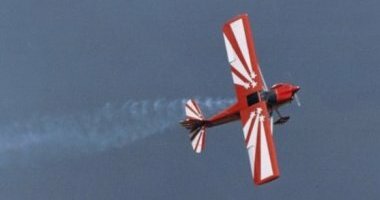 Plane to plane photo of me doing a knife edge maneuver. As long as the speed holds up, one can fly a Decathlon on its side. Engineering is more than an occupation to me. 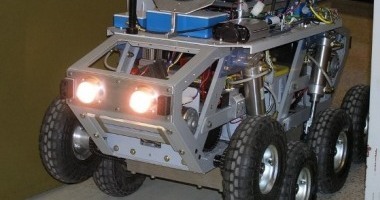 It is a passion, in that I love creating, building, and testing devices that incorporate new or unusual concepts. Engineering is one of the things I do for enjoyment both at work and in my personal time. 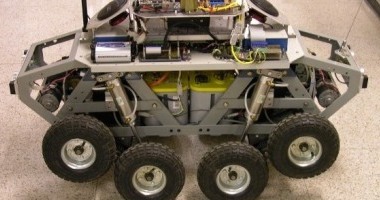 Visit this section for examples of my engineering interests and specialties. From that day in 1968 when I first rode in an airplane, I have been fascinated by the pilotage of airplanes. My interests are not what one would expect from an engineer, as I care little for modern aircraft or innovation. I am a "Stick and Rudder" man. I love the feeling of being one with a machine. This section lays out my aviation past. I first began my university-level teaching at Northwestern State University as a graduate student in the 1970s. Today, I am a professor of Applied Physics at Louisiana State University - Shreveport. Few careers would have matched my desires to expand my technical abilities better than teaching at the college level. 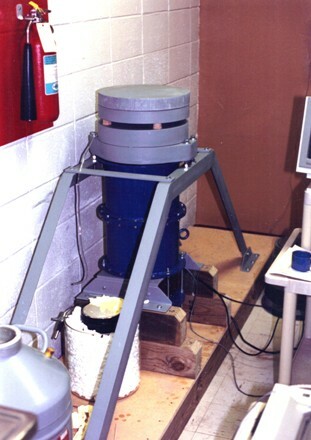 The experiment involved using palladium and platinum as electrodes to perform the electrolysis of deuterium oxide (heavy water). The claim stated that once the palladium was loaded with deuterium there was some sort of nuclear reaction that took place, generating enough energy to melt one or more of their electrodes, as they claimed happened in the lab. These were noted scientists, and were taken seriously, so seriously that many labs around the world almost instantly decided to attempt their research efforts to recreate their claimed results. 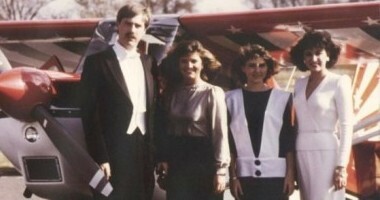 I had been working as an instructor for Louisiana State University – Shreveport for around a year when this story broke. It is difficult to now comprehend how the scientific community reacted to this news. It would have changed the entire face of energy production for the world, yielding cheap and abundant energy that would have been easy to generate from low-cost materials. That euphoria reached the Physics Department of LSUS headed by Rex Matlock, my boss. Rex had been at LSUS since the beginning, and had chaired the Department for all of those years, yet had done no research, as LSUS was at the time primarily a teaching institution. I have seen few high reward scientific areas that I was not willing to tackle, if given a good chance. Looking at the Pons and Fleischmann experiment, it was easy and straight forward, and seemed to literally beg me to jump into my own version of the excitement. I approached Rex and said that I could do this experiment if he would furnish some money to pay for materials. 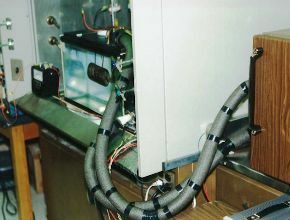 Not only could I set up the cold fusion cell, but I could also engineer equipment that would monitor the temperature of the cell to denote any rise above the normal values. Rex liked the idea and told me to go see the Dean for money. I did, and the Dean sent me back to Rex. Since Rex has some discretionary funds, he finally opted for payment from his department and gave me the go-ahead. As soon as the local new media found out we were conducting the experiment, they were like paparazzi! 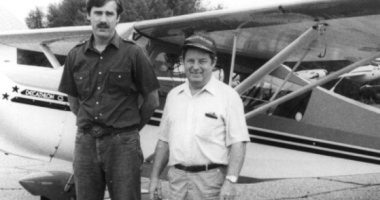 We were constantly being called for interviews, and I believe all of our team, which soon included organic chemist Frank Collins, had our faces on the front page of the Shreveport Times and Shreveport Journal more than once. I still have recorded TV interviews where I gave statements similar to a new conference. And all we had done was to perform electrolysis of heavy water using two precious metals. It seemed insane, but everybody in Shreveport was watching us. I now can’t remember how many versions of the experiment I actually engineered, but each and every one performed the same, as recorded by my instrumentation. All produced not one single joule of extra heat energy. 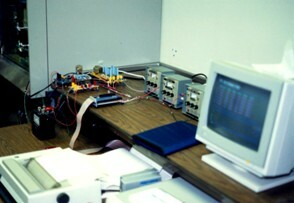 We were not alone though, as labs from Cal Tech to MIT could not produce the claimed energy either. Along the way I developed a couple of neutron detectors to look for bursts of neutrons, a telltale indicator of a nuclear process—No neutrons. Probably the funniest event that occurred in our lab on the third floor of the Science Building was when I created my own experiment to look for neutrons. Our 1500-pound neutron detector I designed and constructed had failed to see any neutron bursts over its short lifetime, but I wanted to try something a bit on the wilder side. I had heard that some scientists in Italy had detected neutrons coming from a crystal of palladium after being loaded with deuterium to form what is called a hydride. They speculated that the bursts were coming from fractures occurring in the crystal’s structure. That gave me an idea. I created my own experiment where I loaded a palladium crystal at cryogenic temperatures, far colder than our other experiments. I could not use heavy water due to its temperature of freezing, but substituted another electrolyte. I used alcohol and dry ice to keep things cold, as I used electrolysis to do the crystal loading similar to before. My plan was to build a chamber that could be heated to thousands of degrees in a matter of a second or two. I planned to quickly take my hypo frozen crystal and place it into the chamber before the deuterium off gassed, ignite some heating material, and look for bursts of neutrons as the crystal went from super cold to super hot almost instantly. Surely this thermal shock would cause internal stress cracking. At least that was my reasoning. This was a long shot, but one that would have paid phenomenal dividends should I have hit on a technique to liberate neutrons. It would have been a major discovery had I detected neutrons, and would have been followed with papers and far more research. I pondered how to heat my crystal, and finally decided on a chemical mix that is very exothermic but also very show burning. In observations conducted in open air, the material generated a great amount of heat but took a considerable amount of time to totally combust. This action is what I wanted. 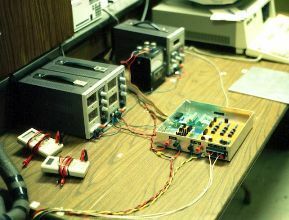 To make a long story short, I used the material to surround my crystal, placed the assembly into our neutron detector, and prepared the computer and electronics to record bursts. It looked like something from a science fiction movie. 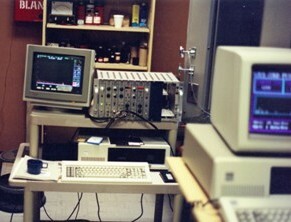 I had cables, wires, panels full of controls and monitoring equipment—all was ready! Frank Collins, our chemist, was with me when the countdown started there in our lab. 5.. 4.. 3.. 2.. 1.. and I threw the switch on the power supply that ignited our slow-burning material. The unintended explosion that resulted literally shook the building blowing the suspended ceiling tiles upwards from the expansion of the gasses in our chamber. The smell of the burning chemicals permeated the lab as every professor on the third floor came running to our location. We actually have an appointed safety officer that is in charge of being sure that nothing dangerous happens in our Science Building. One would think that he had never met me. Actually the truth is that he had. He was Dr. Frank Collins who was standing next to me when I threw the switch on our “slow burn.” I should have known from my early childhood that slow burning self oxidizing materials react violently when confined. It was a “duh” moment. Neutrons? No we didn’t get no stinking neutrons, not a one! I carefully examined the recorded data from before, during, and after the explosion and the count rates were completely flat. In the years following our attempts to recreate cold fusion, scientists eventually determined that the original research was hugely flawed. I am not sure what happened to Pons and Fleischmann, but they were definitely not on everyone’s invite list for reputable science seminars after their debacle. Rex, Frank, and I went on to publish several papers however on separation factors of hydrogen isotopes, including in the prestigious “Fusion” publication that centers on hot fusion. Our publications came from determining the ratios of various isotopes of hydrogen during electrolysis, including regular hydrogen, deuterium, and tritium. That research was noteworthy, and a total sidebar to our original efforts. "We are all born ignorant, but one must work to remain stupid." 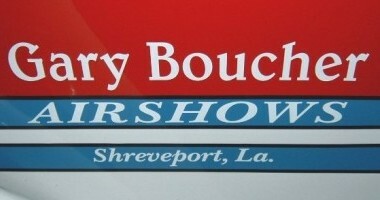 Copyright 2013 by Gary R. Boucher. All Rights Reserved.